In case you need a quick and easy appetizer for the football games on New Year's Day and are like me, who forgot completely about these games and focused all of my food efforts on New Year's Eve, then have no fear because this "man food" will save the day. Please note that although I reference "man food" I almost ate an entire plate of this myself so there is certainly no discrimination intended. When I reference that term, I mean that you will win over the hearts of any man in your house who gets to devour this little treat... hence "man food!" I made this for our ugly sweater party among many other cocktail party foods and this dip (by far the easiest thing I made that day) got the biggest and best reviews. I then made it for our family Christmas gathering at Todd's aunts house and again... BIG hit. There is just nothing better than having a "go to" appetizer that is quick, easy, and tastes SO good. I will say that I toyed with the thought of adding more jalapenos or more green chiles but don't do it. It's perfect the way it is. It has a great depth of flavor and just the right amount of heat the way it is. Preheat the oven to 375˚ F.
In a medium bowl, combine the cream cheese, mayonnaise, green chiles, jalapeños, and shredded cheeses. Mix thoroughly with a spoon or spatula until smooth and evenly combined. Spread the mixture into a baking dish (approximately 9 x 9-inches). 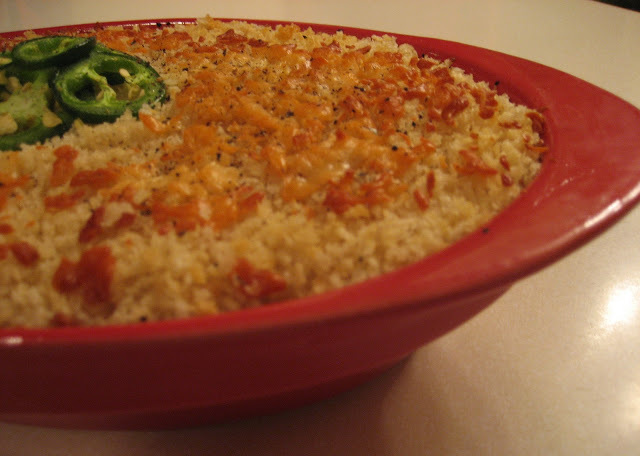 Sprinkle the Panko Crumbs over the cream cheese mixture first, then add the parmesan on top of the panko. Spray lightly with cooking spray. Bake for 25-30 minutes or until the mixture is hot and the topping is golden. Serve with a medley of crackers, baguette slices, and vegetables. Just posting this recipe makes me hungry. I think I should make a batch to "test" before New Year's Day! Hope you love it! Yum, that sounds SO good! Though it does go a bit against my 'need to eat healthier' plans for this month :) I'll have to try this next time I'm having lots of people over so they can help me eat it! I so agree Annie! I made it for a few holiday parties, but if you have any boys over for a game... you won't even get a bite!